Berlin is without doubt one of the main centres for shopping in Germany and the numerous districts provide a shopper's paradise. Whether you are looking for fashion, antiques, furniture or home accessories, rest assured that Berlin will provide you with a huge choice. For high-fashion and trendy clothes, try visiting the many boutiques along the side street of the Ku'damm, such as Fasanenstrasse, Knesebeckstrasse, Mommsenstrasse, Bliebtreustrasse, Schlüterstrasse and Uhlandstrasse. There are more less expensive and less trendy shops in the outdoor shopping mall along Wilmersdorfer Strasse, where locals often do their shopping. This is a popular place to shop at the weekends and consequently, it can become very busy. Some of the most elegant shops in Berlin are situated in this shopping district, including a new, large Galeries Lafayette department store. The Unter den Linden is also located nearby and here there is a selection of boutiques, mainly between Friedrichstrasse and the Brandenburg Gate. Some of these also sell old costumes from the opera houses, as there are also many tourist souvenir shops. In the Nikolai Quarter, new specialist and smaller clothing stores have recently opened. 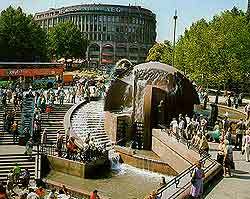 There are many very affordable shops around the Alexanderplatz, offering items such as perfumes, clothes, electronic goods and much more besides. This is probably the city's most lively and famous shopping area, with many interesting side streets, particularly between Brietscheidplatz and Olivaer Platz. 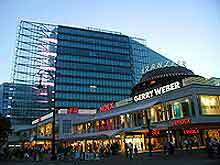 With over 100 shops, cafés and restaurants, the Europa Centre at Brietscheidplatz is well worth a visit. Berlin's most celebrated department store, the Kaufhaus des Westens - KaDeWe - can be found at the end of nearby shopping street Tauentzienstrasse. 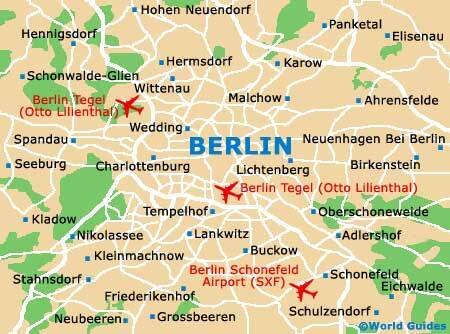 Other shopping regions nearby are the elegant Uhland-Passage and the Kempinski Plaza. Joined by underground passageways, these three shopping blocks are full of great shops. In particular, Quartier 206 is home to a large department store which sells a wide selection of furniture, home accessories and big name designer clothes, such as Gucci, Cerruti, Donna Karan and Strenesse. Set in the heart of the city, this shopping mall is one of the newest in Berlin and is also one of the largest, containing over 150 local and international shops, cafés and restaurants, both large and small. There is a good selection of boutiques and stylish department stores and they are all housed under high glass ceilings, supported by large marble columns. This large and stylish department store can be found in Quartier 205 and the stunning interior features two large glass cones that are five floors high. With a great food hall in the basement, full of fresh specialities and splendid wines, and high fashion from designers including Yves Saint Laurent. and Christian Lacroix, there is plenty here to see and buy. With eight floors of shopping, the Kaufhaus des Westens ((Department Store of the West),) has everything that you might need - designer label clothes, fashion accessories, a large food hall on the sixth floor and at the top, an inviting caféteria, which provides an ideal place to take a break after a hard day's shopping. This store is huge and there is a department that is devoted to almost everything imaginable and it was the only department store in the city to escape destruction in World War II. Located at the north end of the Alexanderplatz, the Kaufhof has a truly stunning gourmet food department, which is well worth visiting. 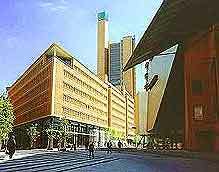 Offering a large selection of fine wares, the Wertheim department store is located in downtown Berlin. Although it is not as big as the KaDeWe, there is still much to look at - and buy.